Although their work is essentially rooted in the American "minimalist school" John Adams and his younger compatriot David Lang, have both striven to push the boundaries of their musical language to open up new horizons. That said, there is no mistaking their own, individual compositional voices. Of the two composers, it is the music of David Lang that I suspect will always divide opinion to the greater degree. Indeed, the two works by Adams presented here have attained something of a cult status, particularly in the case of Short Ride in a Fast Machine, which must have received literally hundreds of performances in its first few years of existence. Although I would not want to be without a recording of the orchestral original of this work I have to say that this transcription for wind band by Lawrence T. Odorn is finely done. More to the point, when it is played with the kind of stunning virtuosity demonstrated here by the Netherlands Wind Ensemble, it is irresistible. I have played this performance over and over again and have still not tired of it. Grand Pianola Music, conceived on an altogether "grander" scale as the title suggests, receives an equally mesmerising performance. It is easy to lose sight of how difficult this music is to pull off and I found myself frequently marvelling at the delicacy and perfectly graded balance of the playing and ensemble. At a little over half an hour in length (the first movement alone accounts for half of this) Adams never loses the listeners attention and manages, against the odds some might say, to create an impressively convincing feeling of being on a journey, resulting in a truly joyous and satisfying conclusion. The scoring is for wind orchestra with the addition of three sopranos, or "cooing sirens" as the composer puts it, and two pianos. It is the slightly out of phase part for the two pianos that creates the pianola imitation of the title, the pianos being used to excellent effect in the final movement, On the Dominant Divide. Everything that is to be admired about this performance is on display in the opening minutes of the first movement. By the soprano entry just before the five minute mark I was totally hooked and as a result have already tagged this as something of a benchmark performance in my Adams collection. Anyone familiar with the music of Jimi Hendrix will recognise Are You Experienced? as the title of both a song and album by the late rock legend. As someone with little knowledge of Hendrix I am uncertain as to whether David Lang quotes musically from the song or not (I suspect not). There are certainly references in the spoken narration however, notably at the conclusion of the work, "Dont scream, Dont cry, Your world will let you go" Lang takes as his premise the listener having experienced a blow to the head, the narration subsequently guiding the listener through various states of consciousness. Scored for an ensemble of single woodwind, brass, strings (minus violins), keyboard, synthesiser and percussion, Lang adds an electric tuba here played magnificently by Hendrik Jan Renes. Take a listen to the extraordinary, electronically manipulated solo cadenza at the end of the section entitled "Dance" for a fine example. 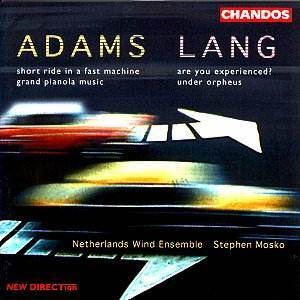 Where Langs music clearly differs from Adams' is in his conscious use of dissonance and certain avant-garde techniques, albeit strictly controlled and within a broadly tonal framework. Where Are You Experienced? is rhythmically dynamic and dance like in its allusions to popular music, Under Orpheus is far more static in conception, exploring one and two note tremolandos in each of its two movements. An "expansion" of an earlier work scored for two pianos alone, entitled Orpheus Over and Under, here the pianos lead a double instrumental ensemble who take up and extend the pitches and textures created by the pianos. For my money, Are You Experienced? holds more interest although the performances make for a rewarding listen in both cases. In terms of longevity of appeal I have little doubt that David Langs music is more likely to become a victim of stylistic fashion than that of John Adams. Nevertheless, he is a composer with something original to say and this disc represents an ideal opportunity for listeners to make their own judgement on the artistic and philosophical merits of his work. Either way, anyone with even a passing interest in the music of Adams or Lang should not be without this disc. Both the recordings and the performances are as fine as we are ever likely to hear.